Located 410 km by road north of Noumea, the sleepy locality of Poum has seen the construction of a world class holiday resort, Malabou Beach Resort. 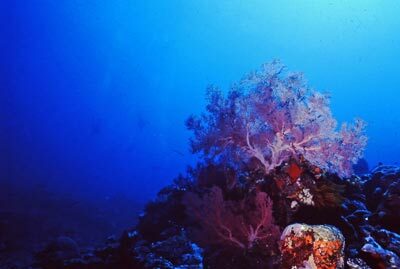 The dive sites are about 35 to 45 minutes away and in the morning it is a pleasant trip out, although the trip back can sometimes be a bit wet due to onshore winds. 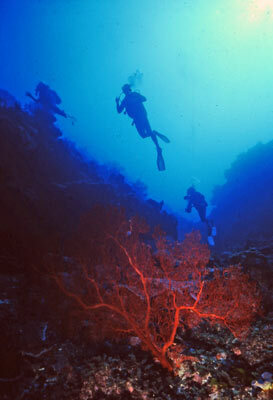 Another dive site is Les Pitons (The Peg or Bolt) which is located further south from False Pass. 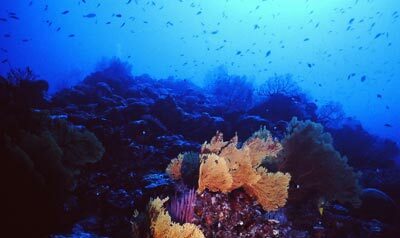 This site consists of a protected corner of the reef which drops from the surface to 30 metres. 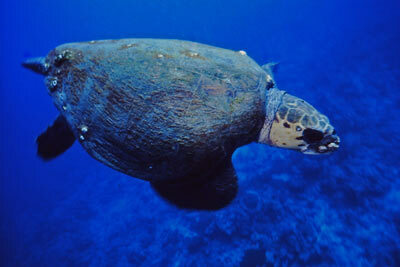 The reef itself has numerous caves, tunnels, holes and bays which make for a very exciting dive. At times you end up totally surrounded by the reef, with only a narrow tunnel or pass to exit back outside. The coral and fishlife was very good although there were not many big fish. Once again, for any one who likes to explore tunnels, this is a dive you will really enjoy. From here it is a 45 minute trip back to Malabou Resort. On the day I visited the south-east sea-breeze was up so it was a bit rough but not too uncomfortable. Photographs taken 1993 using Nikonos IV-A and scanned from slides 2011. Since I visited New Caledonia the Australian dollar has strengthened against the Pacific Franc so things should be cheaper.